Ignore those packaged ice-cream cones from the supermarkets; instead head straight for IJscuypje for a cone of hazelnut, pistachio or a dozen-plus other flavours. Take the gamble and let them scoop you some of whatever is currently spinning in the ice-cream maker. IJscuypje is very popular and has a number of ice-cream parlours in Amsterdam. Their Ice cream, sorbet and frozen yoghurt are all prepared on-site. 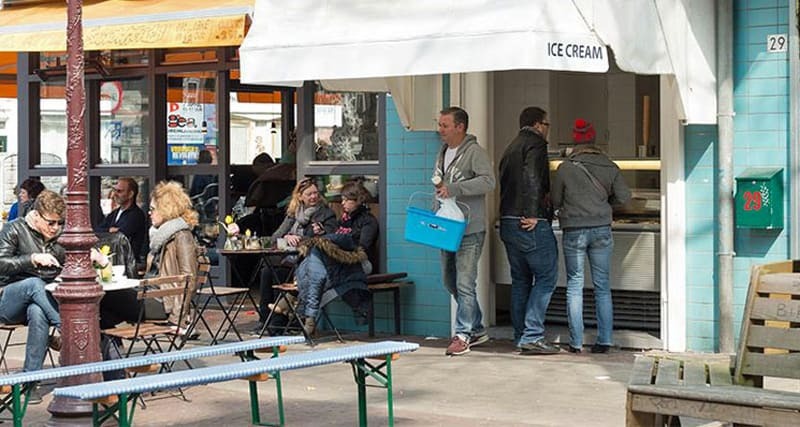 Ice-cream in summer means a visit to IJscuypje, a household name in Amsterdam – artisan ice cream made according to traditional recipes and so delicious and addictive that you will never want to have any other ice cream. You simply must try this creamy Dutch ice cream in unusual flavours like bitterkoekjes and speculaas and surely an acquired taste. Once you are hooked, you will come back again and again. IJscuypje is open in spring and summer. When autumn comes, the ice cream parlour turns into Stamppotje for the winter season, serving stamppot, a traditional Dutch dish of mashed potato and vegetable. Quite different from summertime ice-cream but equally delicious!